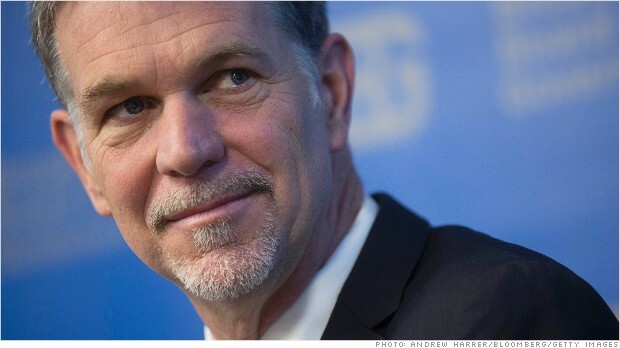 Netflix CEO Reed Hastings will see his scheduled base salary and stock options jump by 50% in 2014, according to a government filing by the company. Hastings is set to receive an annual salary of $3 million and an additional stock option allowance of $3 million. A year ago, he was awarded $2 million in salary and $2 million in options for 2013. But his final 2013 pay is expected to be significantly higher, because Netflix stock has soared this year. Netflix (NFLX) shares are up nearly 300% this year, making it the best performing stock in the S&P 500. Related: Portrait of Netflix’s Hastings as a young man Other top executives at Netflix also received raises, although their increases were less than Hastings’ 50% pay hike. In a separate filing the company also announced it was dropping its poison pill plan that it instituted in November 2012 after activist investor Carl Icahn bought a 10% stake in the company. Related: Netflix’s Hastings – Settle down about our stock The plan would have allowed the board to flood the market with new shares and make a takeover prohibitively expensive if any shareholder had bought more than 10% of shares without the approval of the company’s board. This entry was posted in SCIENCE AND TECH and tagged $2 million, $3 million, Carl Icahn, HASTINGS, HIKE, NETFLIX, Options, Reed Hastings, Salary.